Microsoft made some long expected announcements today -- the return of the start menu, one version of Windows 10 across all devices and an attempt to make Windows apps work across those same devices. Unfortunately, the limited overlap between Windows PC developers and mobile developers makes the latter a weak proposition. On the other hand, Microsoft's HoloLens headset may have some potential. I have long been a believer in the long-term potential of "field of vision" devices (AR and VR) for one simple reason -- despite their downsides, their potential benefits cannot be matched by existing computing platforms. In my opinion, this is a necessary (but not sufficient) condition for triggering a new market disruption. While we are still in the early stages of the technology (think first mobile phone, not first smartphone), I believe we could see increasing consumer interest in this category over the next five years. 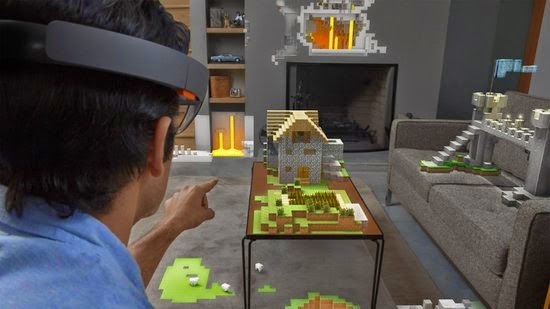 Looking at HoloLens specifically, it holds a couple of advantages over other field of vision devices we have seen so far -- 1) It is not meant to be mobile (at least for now) so social acceptance will not be a barrier, 2) It blends elements of augmented reality and virtual reality. The second point is particularly interesting as it falls between the "glance" based interaction model targeted by Google Glass and the complete immersion provided by Oculus. By allowing users to interact with virtual, 3-dimensional objects (not really holograms) in their surroundings, Microsoft is exploring a truly novel interaction model here. Another good sign is that hands-on experiences of the device from enthusiasts and the press seem fairly positive. Increasing awareness could help attract developers that are interested in exploring new interaction models. All in all, it seems like Microsoft is going in the right direction with this technology. That said, there are some very obvious pitfalls here for Microsoft. Since this isn't meant to be a "mobile" device, it could potentially be used in conjunction with other devices. Microsoft showed off this particular use case in the "Mars demonstration" -- Users on their PC could move their mouse cursor "off screen" to interact with the virtual environment. There may be a temptation here to link the HoloLens technology (or platform) with Windows to increase developer interest on their mobile platforms. That could immediately shrink an already small early adopter base and cause mobile developers to look at options like Oculus and Magic Leap. But as long as Microsoft plays their cards right, they may be on to something here.